Four years after scheduled graduation, students from small high schools of choice, which have nonselective admissions and serve many disadvantaged students, were more likely to be enrolled in postsecondary education and to be participating in “productive activity” (being in college, being employed, or both) than their control group counterparts. Assessment-to-Instruction (A2i) is a data-driven professional support system that helps teachers tailor instruction for each child. When delivered with intensive in-person training, it is effective at improving students’ reading ability. This Issue Focus introduces the evaluation of a delivery model that uses technology to make the system more affordable. In summer 2016, TFA piloted a redesigned training model for its teachers that incorporated college- and career-ready standards and methods. This study examined how the new model was implemented at one TFA site and how it compared with the usual TFA training at other sites. This issue focus discusses the conclusions of a recent MDRC working paper, Project-Based Learning: A Literature Review. The paper found that project-based learning holds promise for improving students’ outcomes but that much remains to be learned about its effectiveness and about how its implementation can be strengthened. Examining the scholarly literature published since a seminal review in 2000, this working paper discusses the principles that underlie project-based learning, how it has been used in K-12 settings, the challenges teachers have confronted in implementing it, and what is known about its effectiveness in improving students’ learning outcomes. PowerTeaching emphasizes cooperative learning to instruct middle school math and has shown strong evidence of effectiveness. 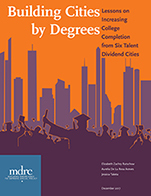 In 2011, the U.S. Department of Education funded an effort to scale up the program, and in 2012 MDRC began a multiyear evaluation of it. This report describes the evaluation and presents its findings.